Turn off automatic sprinklers now that cooler weather has arrived. Most grasses go dormant until spring, which reduces your lawn’s need for water. 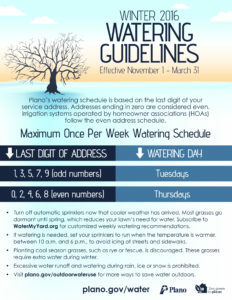 Subscribe to WaterMyYard.org for customized weekly watering recommendations. Planting cool season grasses, such as rye or fescue, is discouraged. These grasses require extra water during winter. Excessive water runoff and watering during rain, ice or snow is prohibited. Just because it is your day to water doesn’t mean you need to water. *As HOA watering involves watering of their common areas and in many cases the City of Plano right of way (which has no address), it was decided that all HOA watering and addresses ending in zero would follow an EVEN address watering schedule. Newly installed landscapes may be granted a 30-day water variance upon approval. Variances are not required for filling pools. Residents can sign up for texts or emails with guidance on when watering is needed at the Water My Yard website or by avoiding watering when rain has just occurred or is expected.